The con whirl continues this weekend and you can Meet the Beat – and a lot of other folks – at the Long Beach Comic Con, in Long Beach. The Beat – that’s me, Heidi Macdonald – will be TABLING at Booth #601 with signings and chatter. I’ll have the complete signing schedule later today, but the rest of the show has a full schedule. Its the show’s 10th anniversary edition and they’ve lined up a full slate, including Guest of Honor Christopher Priest, a Twin Peaks reunion (this is the water, this is the well…), wrestling and…THE BEAT. The con proper runs this weekend but on Friday, Sept. 7 there will be a pros-only Coic Creator Conference with programming for professional development. Details here. Since the early ’80s, Jaime Hernandez has created some of the greatest characters and storylines of modern comics in his award-winning series LOVE AND ROCKETS. In this freewheeling conversation with THE BEAT’s Heidi MacDonald, he’ll talk about the origins of Hoppers, Maggie and Hopey’s current adventures, his recent graphic novel LA MATADRAGONES/THE DRAGON SLAYER, his working methods, and more. Presented by the LOS ANGELES TIMES EN ESPAÑOL. Jaime Hernandez will follow the panel with a signing at THE BEAT, booth 601 on the show floor. Full programming schedule is here, guest list is here. Tickets can be purchased here. More info, provided by the show runners. 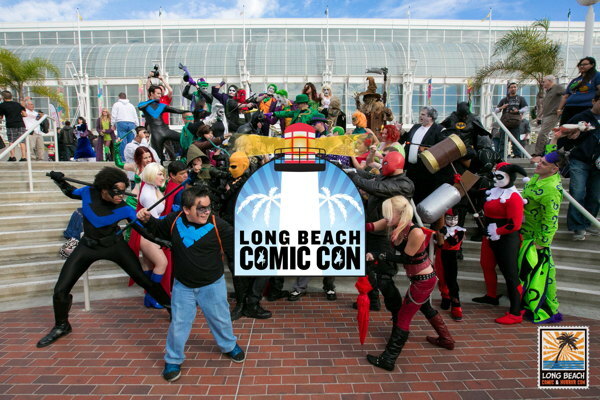 Returning to Long Beach Comic Con, SOCIAL SQUARE is the event’s official hub for social interaction. Anchored by the NERDBOT stage and their continuous Facebook Live stream to more than 500,000 fans, SOCIAL SQUARE will feature appearances and interviews with many beloved pop culture personalities, including WWE legend Rikishi, TWIN PEAKS stars including Sherilyn Fenn, Ray Wise and many more. SOCIAL SQUARE will offer fans a constant source of entertainment and engagement, including trivia games, live comedy and music. Attendees are encouraged to check the SOCIAL SQUARE schedule for updates on guest appearances, surprise drop-ins and more. Sponsors include BERNINA of AMERICA, CAULIPOWER, the LOS ANGELES TIMES EN ESPANOL and THE BEAT. Prepare yourself for thrills, chills, and a pile-driver to your senses — Long Beach Comic Con’s 10th edition is just days away and the stars are coming out to play! For film fanatics, this year’s Geekfest brings more than 30 fantasy, science fiction, horror, and fan films to LBCC. Watch the screenings and vote for your favorites as they compete for the top spot in the annual Best of Screening and Awards show, hosted by Farscape star, Gigi Edgley. Share your love of genre films with other fans by attending some of the gripping panels like Women of SciFi, Women of Indie Horror, and the Geekfest Filmmakers Panel. Visit the Geekfest booth for some exclusive swag, and meet some of your favorite celebrities for selfies and photographs, including Power Rangers Zero’s Nakia Burrise, indie horror star, Jackie Dallas, and actress, comedian and voice actress, Michelle Specht. Ready for some rocking wrestling action? For the first time at LBCC, fans can catch the action ringside during Pro Wrestling matches right on the show floor! Visit the KnokX Pro Entertainment ring, located near Space Expo, and watch Rikishi and other Pro Wrestling stars including Black Pearl, Sefa Fatu, VIP, Akanesi, Otto Von Clutch, Krakken Zero, Bison, K Dubb, and Sgt. Stu SA as they battle it out live! The wrestlers will also be on-hand for autograph sessions throughout the show. This is one event you don’t want to miss! This year is the debut of a partnership between Long Beach Comic Con and the LOS ANGELES TIMES EN ESPAÑOL, with the LAT backing four special panels at the show, among them a spotlight panel on LOVE & ROCKETS’ Jaime Hernandez, a panel on new Latinx creative voices in comics, featuring BORDER TOWN writer Eric M. Esquivel, Sebastian Kadlecik, who wrote the Eisner Award-nominated QUINCE, and cartoonist Melina Chevarria of THE MAGIC GLASSES. The show also features a Sunday panel on Latin horror, folklore, and fantasy taking a greater role in comics, and, topping it all off,LBCC’s first-ever bilingual panel: Tearing Down Borders/Derribar Fronteras, a panel exploring how Latin creators are dealing with a political landscape that’s grown increasingly hostile to their culture. LBCC offers a wide range of comics-focused panels this year, with publisher partners Alterna Comics, AfterShock, Valiant, and DC all taking part in panels spotlighting their plans for the coming months. Marv Wolfman joins writers Adam Glass and Bryan Edward Hill for a one of-a-kind Teen Titans panel celebrating the past, present, and future of the franchise; DC SUPERHERO GIRLS artists Yancey Labat and Monica Kubina join MY LITTLE PONY’s Tony Fleecs and others for a kids’ comics panel Sunday morning; and an all-star panel of creators – including Margaret Stohl (THE MIGHTY CAPTAIN MARVEL), JK Woodward (STAR TREK), and James Jameson (AMERICAN GODS) – talk about adapting things in and out of comics. TEENAGE MUTANT NINJA TURTLES co-creator Kevin Eastman appears with IDW on Sunday for a rare LA-area appearance while writer Jonathan Ames and cartoonist Dean Haspiel celebrate the tenth anniversary of their collaboration THE ALCOHOLIC in a panel moderated by acclaimed cartoonist Bob Fingerman (MINIMUM WAGE, MAD MAGAZINE). Creators just getting their start in comics can learn about the craft of making comics from veterans and new stars on the scene in panels about writing, drawing, and even prepping a portfolio; and fans of the history of the medium can join experts and creators alike for a special rememberance of the late Steve DItko. On the non-comics side, panels on animation writing, BATTLESTAR GALACTICA, and Q&A sessions with GAME OF THRONES’ Hodor, actor Kristian Nairn; as well as one with some of the biggest names from TWIN PEAKS – including veterans like Ray Wise and Harry Goaz (Leland Palmer and Deputy Andy) and newcomers Chrysta Bell and Robert Broski (Agent Tammy and the “Got a Light” Woodsman) – are sure to glue fans to their seats; while an exclusive screening of the new horror film THE TOYBOX (starring WILD THINGS’ Denise Richards and THE O.C.’s Mischa Barton) will keep viewers on the edge of those very same seats. It was a total blast! So much fun meeting you! !